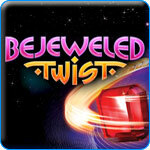 Bejeweled Twist Game - Download and Play Free Version! Spend Hours Matching and Exploding Gems in This Intriguing Puzzle Game! Game Created By - PopCap Games, Inc.
Get ready to rotate, match and explode colorful gems! With Bejeweled Twist, you can rack up points by matching three or more jewels of the same color. Whether you are a puzzle veteran, someone who enjoys brain-busting puzzles or if you simply enjoy casual games, the addictive gameplay of Bejeweled Twist will appeal to a wide variety of playing styles. Gamers of all ages are sure to find an enjoyable aspect of Bejeweled Twist! You play on a board containing an 8 x 8 grid of jewels. Unlike previous versions of Bejeweled, you cannot flip two gems to create a match of three colors. In Bejeweled Twist, you can only rotate a group of four gems to create a match. This is accomplished by using the Gem Rotator, a silver ring that surrounds a group of gems. Each time you click your mouse, the gems will rotate in a clockwise position. Gems cannot be rotated counterclockwise. When you successfully match at least three like-colored gems, they disappear and more gems are added to the board. There is also a Level up Tube that appears on the left side of the board. The tube gradually fills up as you make matches of jewels and you are able to advance to the next level once the tube is completely filled. The instant replay button becomes available if you make a particularly dazzling move that scores many points. You can find seven different colors of gems in Bejeweled Twist. These include violet, yellow, red, white, orange, blue and green. All gems are scored the same unless you create a match containing a special gem. Flame gems: These can be created in two ways. In addition to creating a match of four like-colored gems, flame gems can also be created by matching two sets of three gems. This can be accomplished by creating a plus sign, L or T shape with matching gems. Flame gems explode when they are matched and destroy the eight gems that surround them. Lightning gems: If you match five gems in a row, a powerful lightning gem is created. When this special gem is matched with other gems, it sends an impressive bolt of energy that destroys all gems in the same column and row. Coal: Coal rocks are motionless and can only be matched with lightning gems or flame gems. Locked gems: Once you reach level four in Bejeweled Twist, random gems will become locked. While these gems cannot be rotated, you can match them with other gems and with flame and lightning gems. Bomb gems: These gems appear early in the game and they have a large number that counts down every time you twist a group of gems. They can be matched with any type of gem, including other special gems. If you are unable to match the bomb gem before time runs out, you will have another opportunity by spinning the Disarm Spinner. This unique game option consists of eight gems, some of which turn into skulls. Your game ends when the spinner lands on the skull gems. If you stop the spinner on a pair of gems, your game will continue. Doom gems: Similar to bomb gems and occur once you reach an advanced level in the game. These special gems can only be destroyed with lightning and flame gems and cannot be matched with any other gem. They have a counter that counts down on every non-matching move that is made. Fruit gems: You can create fruit gems by maxing out your score multiplier. This is achieved by making consecutive gem matches. Fruit gems destroy all gems of the same color, break all locked gems and add time to bomb gems. 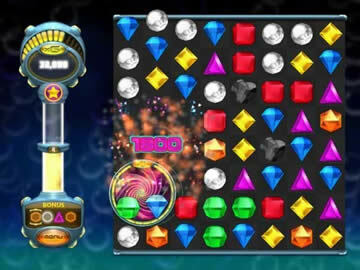 Bejeweled Twist has four game modes for you to choose from. Each mode offers a different way to play. Classic mode: The basic way to play Bejeweled Twist and consists of a board containing regular gems, bomb gems, doom gems and locked gems. Zen mode: You can choose Zen mode if you would like to play the game in a relaxing and pressure-free environment. There is no doom, bomb or locked gems and since there is no end to this mode, you can play for as long as you would like. Blitz mode: Very similar to classic mode, except you only have five minutes to accumulate a large number of points. If you prefer a faster pace to the game, Blitz mode is definitely for you. 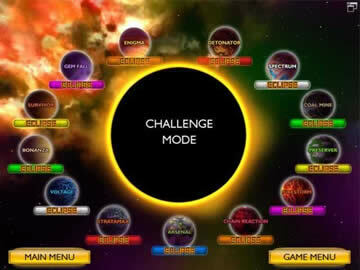 Challenge mode: In challenge mode, you are presented with a variety of goals to accomplish. This may include destroying a certain number of gems in a single move, matching certain gem colors in a row or detonating a specific number of lightning gems in a certain amount of time.